The new Korg PA1000 Professional Arranger Keyboard is the latest model with built-in speakers in the Korg PA series line up. The PA1000 replaces the popular Korg PA900 model and adds even more DNC Sounds, and a hugely expanded library of built-in styles that cover a wide range of musical genres from around the World. The Korg PA1000 has more power than the previous PA800 & PA900 models. In fact, we believe this is the most powerful arranger keyboard in it's class. It represents a huge leap forwards from the PA900 with improved sounds, styles, large Touchview 7" display and a new slimline design to make it even more portable. You must come and try this keyboard for yourself in one of our keyboard shops! There's never been a better time to upgrade to the new Korg PA1000. Trade-in your existing instrument - we accept almost all makes & models of keyboard - as long as they are in full working order and good condition. Email details of what you have to info@musicland.co.uk and we'll get right back to you with a valuation. You can even choose to spread the remaining balance over a number of months using one of our quick and easy finance options. 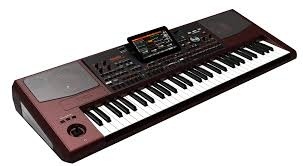 Musicland has specialist keyboard stores with dedicated keyboard experts in store to assist you with any questions you may have relating to the new Korg PA1000. You will be able to see the KORG PA1000 in our stores from November 2017. You'll find us in Romford Essex and Bromley Kent. The Korg PA1000 has a PCM memory capacity that is FOUR TIMES larger than the outgoing PA900 keyboard. It is also possible to import your own samples into the 600MB of user memory, The PA1000 accepts samples in KORG, WAV, AIFF and SOUNDFONT formats. There are 430 preset Factory Styles loaded into the PA1000 when you get it out of the box. There are also an additional 1152 user locations to store your own styles. You can either download additional styles online, or use the built-in MIDI to STYLE CONVERTER to turn your favourite MIDI Files into useable styles. Everything has been enhanced on the PA1000 including the speaker system. This keyboard boasts a massive 2 x 33watt amplifier powering 4 loudspeakers which are housed in a bass-reflex enclosure to give a deep, rich sound. Plug a microphone into the PA100 and you can use the TC Helicon effects to enhance your vocal sound. These legendary vocal harmony effects are among the most natural sounding ever produced and they're right here ready to use inside the PA1000 . Up to three part harmonies can be added to the lead vocal, and these are further enhanced with the EQ, Compressor, Gate and two Insert effects. Due to popular demand, Korg have added two knobs and three buttons for controlling the most important vocal functions in real time. No need for separate vocal harmoniser boxed any more! The PA1000 has the now standard dual song file player that is unique to Korg Professional Arranger series keyboards. The song player plays both MP£ audio and MIDI files, and you can even record your performance as an audio or MIDI file - for easy sharing. The new KAOSS-FX feature gives you intuitive and creative real time control of your performance. Use the touchscreen to morph between style variations, sounds and drum kit types, or use it to give the radical effects made famous by DJ's around the World such as tape delay, filter sweeps and arpeggios. Using the Power of the Korg PA4X these new mid range keyboards are superb value and offer great performance.